It’s pretty obvious that most of us plagiarize each other’s recipes. Unless you have discovered a new fruit, vegetable or species of animal, everything ever prepared to be consumed has been documented and then revised by someone else. So this is my rationalization for borrowing – and personalizing – a recipe from my favorite local fish monger. Joe’s Fish Market in Charleston (304-342-7827) is a great place to buy fresh seafood. 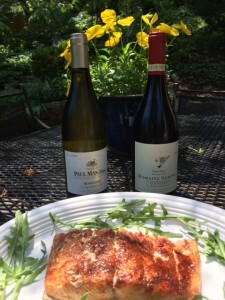 Two brothers – Joe and Robin Harmon – have perfected a “hot smoked” salmon recipe that I have taken the liberty of altering somewhat, and which I’ll share with you (see recipe below). Robin is the smoke master for this delicious treatment of salmon, and each week he labors on his smoker out behind the market to produce this culinary masterpiece. The easy way out is to get to the market early in the week (or call and place an order) and purchase a slab of Joe’s hot smoked salmon. It is simply delicious! But if you have a couple of spare hours, particularly on the weekend when the alternative is yard work or worse (honey-do’s), then you just might try your hand at hot smoking a side of salmon. Oh, by the way, you will love the wines I am recommending to accompany the dish. First though, it’s important to understand the difference between hot and cold smoked salmon. Traditional cold- smoked salmon is produced by hanging sides of the fish in a smoke house where a wood fire is constantly tended to insure that the temperature is between 80 and 90 degrees (F). This process can take a few hours, overnight or a couple of days to complete. If you want to cold smoke your salmon at home, there are actually electric smokers you can purchase for a few hundred bucks. Bradley Smokers are often recommended for home use, but I prefer to hot smoke my fish using my trusty old Weber grill. At Joes, the hot smoked salmon produced in house is brined in water, salt, brown sugar and garlic for a few hours and then smoked for up to an hour over apple wood. They also use farm-raised salmon and recommend using it rather than wild salmon that tends to dry out if you are not careful. The main difference between Joe’s version and mine is the brine where I believe in giving the salmon a little sip of wine and maybe a beer or two. It’s also a good idea to have a taste or two while you’re creating this culinary masterpiece. After all, dehydration is a terrible thing. If you live around these parts, go on down to Joe’s and try his hot smoked salmon, and then go back and buy a side of salmon and smoke it yourself. I don’t claim to say my recipe is better, but it’s pretty good. I hope you give it a try. Wine Recommendations: This tipsy hot smoked salmon needs medium to full-bodied white or red wines. I prefer pinot noir from cooler growing areas in California or ones produced in Oregon. I also suggest Rhone-style whites and medium-flavored chardonnay for the salmon. Here are ones you might try. Pinot noir: 2010 Domaine Serene Yamhill Cuvee ($45); 2011 Melville Santa Rita Hills ($30); 2012 Acacia Carneros ($20); 2012 MacMurray Ranch Russian River ($25). Whites: 2011 Paul Mas Marsanne ($12); 2012 Anselmi San Vincenzo ($14- blend of garganega and chardonnay); 2011 Mer Soleil Santa Lucia Highlands Chardonnay ($27); 2012 d’Arenberg The Hermit Crab Viognier/Marsanne ($15).